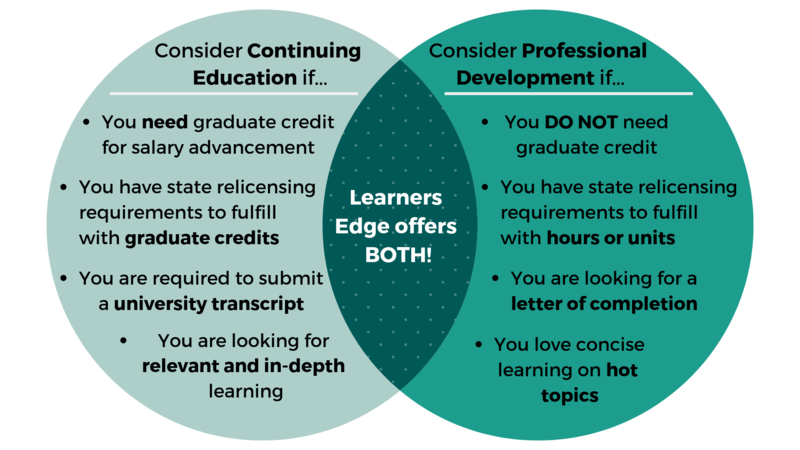 Below is a summary of how Learners Edge may help your continuing education and Arizona teaching license renewal needs. This summary should in no way release individuals from their responsibility of ensuring that the course they take meets their professional needs. We hope it provides assistance in understanding how Learners Edge might help you in the accumulation of clock hours or graduate credit for salary advancement and the Arizona teaching relicensure process. See the Arizona Department of Education website for complete AZ teacher relicensure information. The Provisional Teaching Certificate is valid for three years and must be converted to a six-year Standard Teaching Certificate at least two months prior to it expiring. Official transcripts are required from an accredited institution. Each semester hour of courses is equivalent to 15 hours of professional development. Learners Edge partners with several regionally accredited collegiate institutions providing official transcripts with letter grades for our courses. We encourage you to gain prior approval of this course by downloading a syllabus from our courses page before registration to ensure district approval. Our courses are 3 semester credits of continuing education graduate level content. You will receive an official transcript from a university partner documenting a 3-credit, graduate-level course in research-based systematic phonics. Register for Course 5030 now!